Electronically sign, and now prepare, act on, and manage agreements to deliver great experiences for your customers and employees. This is the Momentum you won’t want to miss! Reserve your spot today! Let’s agree to protect the world’s forests. Our Spring 2019 Release is here. Go digital with DocuSign. We’ll help you scale, even to a global level. It’s easy to start and easy to grow when you choose what Forrester Research* says is "the strongest brand and market share leader: [DocuSign] is becoming a verb." Whether you’re approving a purchase, closing a sale, or signing an agreement, it’s easy with DocuSign—reliable and trusted worldwide for electronic signatures. DocuSign enables people to electronically sign agreements from almost anywhere. It's about more than eSignatures. 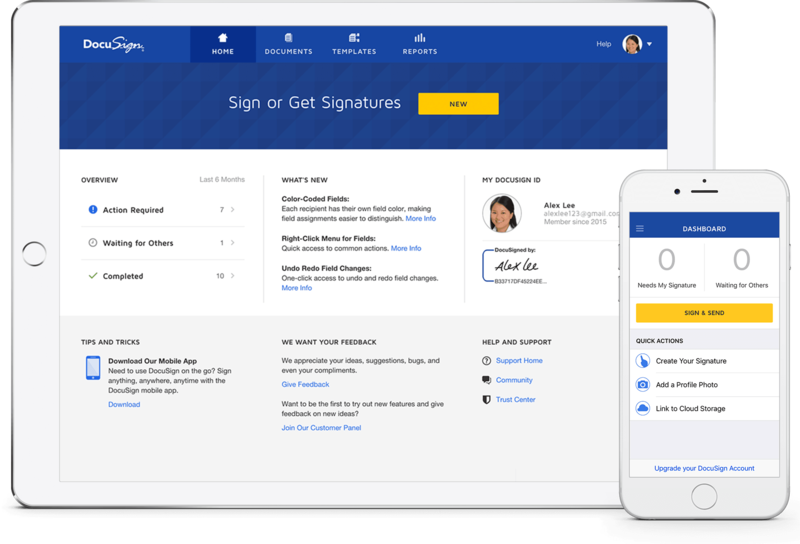 The DocuSign Agreement Cloud™ digitally transforms how you do business.